One of my favorite desserts growing up was a fruit crisp. They are all warm and gooey… yum. 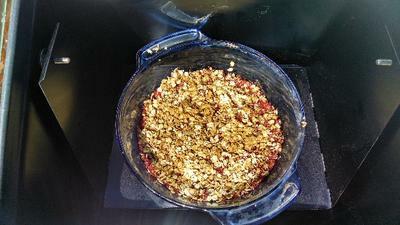 We had a rhubarb patch behind our house, and I often remember cutting rhubarb into my mom’s mixing bowl and taking it inside so we could whip up a quick dessert with it. The other thing I love about fruit crisps is that they hail from the land of "ish". You put some of this and some of that, and pretty much it turns out well no matter what amount or ingredients you try. Today I had strawberries in the frig, so strawberry crisp it is! You could use any fruit really though. Cut up about a pound of fruit and place it in the bottom of your un-greased baking dish. Rating: success! We had a delicious dessert. My only complaint is that I keep burning my hand when I try to take things out of the oven because the swinging tray moves. Maybe I should try cooking without the tray? Otherwise it is nice to have dessert ready without heating up my kitchen!